When it comes to interior space in a boat it is really hard to beat a deck boat. While they are all the rage in Florida and the southern states, they’re still yet to fully catch on up in Canada. When I was at the Toronto International Boat Show in 2015 I noticed an increase in interest for deck boats. 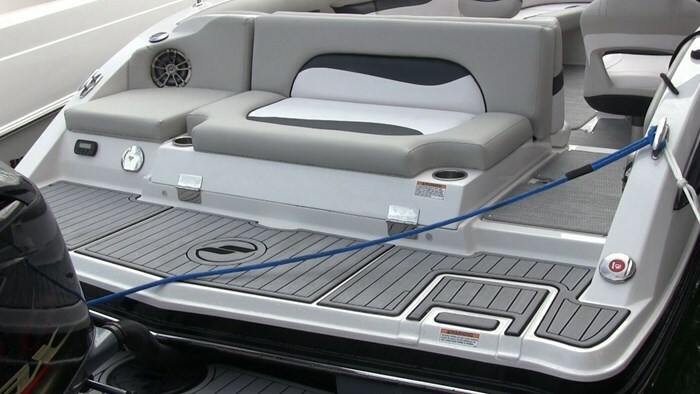 You see there is no denying the rise of pontoons but not everyone is willing to swallow that pill yet, so enter the deck boat. 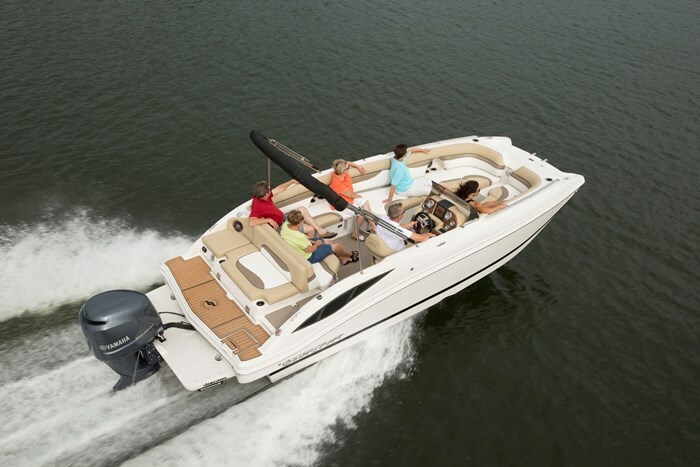 But for those who aren’t ready to go full commit to the deck boat there is a hybrid that blends sport boat styling with deck boat space. At the 2016 Miami International Boat Show I was able to do a test drive of the Starcraft SCX 231 OB EXT. Let’s start first with all of the letters and what do they mean? The first of which is fairly obvious and that’s the OB stands for outboard. As you might have noticed outboards are here in a big way because of their lightweight, space saving and performance. The EXT refers to how the outboard is mounted. On the 231 the outboard is not mounted onto the transom but rather on a bracket that extends it another almost 2 feet from the boat. Starcraft has been doing this for a couple of years now and the benefits are many. First of which is the obvious - it gives you more space at the transom. 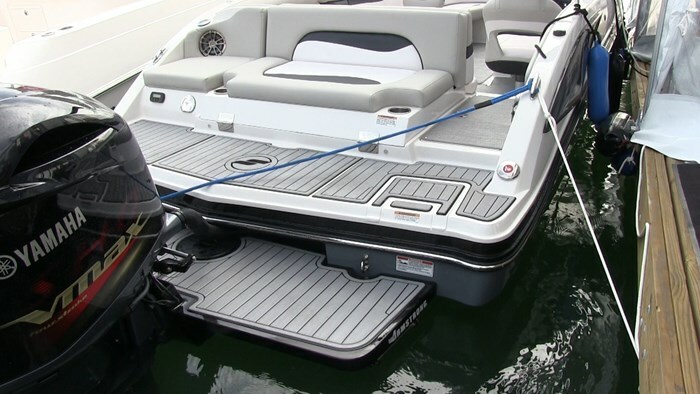 When you mount an outboard to the transom of a boat it cuts into the swim platform reducing the amount of usable space you get. But if you extend it off the back you get a full swim platform and the one on the SCX happens to be one of the best in the business, but more on that later. I’ll try not to make this part too boring but the transom bracket also allows the builder - Starcraft - to only have one mould instead of two. Now they can use the same mould for their IO SCX and just not cut out the spot for the outdrive but instead just attach the bracket. This reduces costs which they pass onto you. Now where there would normally be that large IO motor, you have more storage. Finally by pushing the motor back from the transom you get increased response not only out of the hole but also in turns and throttle response because the motor is running in cleaner water. The SCX is a big boat with a dry weight of 3500 pounds and the 250 hp Yamaha VMAX SHO got it up on plane in just over 3 seconds which is no small feature, but part in parcel to the transom bracket. Now 250-hp is the max rating for the SCX so the performance numbers we got aren’t going to tell the true tale since most will be satisfied getting this boat with a 200. But what it does tell us is that a cruising speed of 25 mph at 3500 rpm and 32.8 mph at 4000 rpm shows that this running surface is a rockstar. I noticed an average of around 5 mph speed increase with every 500 rpm increments. This tells me that the running surface responds well to power and that the Yamaha VMAX SHO delivers it in spades. I have loved these motors ever since I was at their launch in 2009. While in my opinion nothing will ever replace the sound of a 2-stroke, the VMAX SHO has a low rumble and growl that to this day still makes my hair stand on end. This growl was in full force as we hit our top speed of 50.5 mph at 6000 rpm which is the fastest I’ve ever been in an SCX, so I was sold. Now if we get back to the model name of the SCX 231 the “1” in 231 means the open layout down the port side of the boat that we see with this model. The SCX is also available in a more traditional dual console layout for those who like that classic runabout look. But for those looking for the space that a deck boat affords, than the 231 is the layout for you. In the bow is where you will find the hallmark of the SCX line up of boats and that is the pickle fork bow design that lets them carry the 8 foot 6 inch beam all the way forward giving one of the biggest bow lounges in the segment. 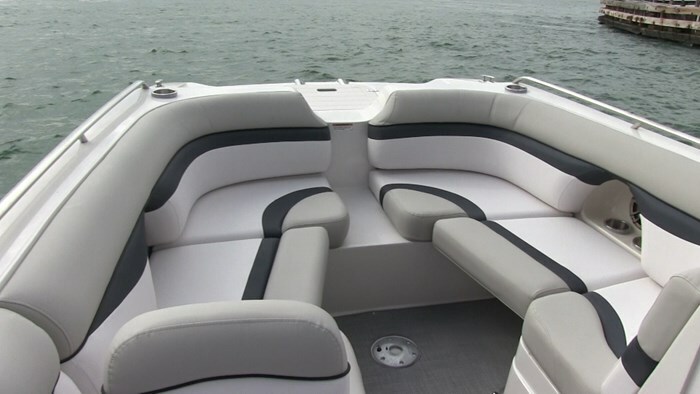 This bow can also perform double duty: when the filler cushions are in you have two lounges to kick your feet up on. But when you remove the cushions you have what Starcraft calls “Quad Pod” seating so 4 people can sit up there. Put in the snack table and you have a place for lunch, cards or just hanging out soaking up rays. This boat has some hidden surprises as well. Directly across from the helm you would see what appears to be just a bench seat but when you lift it up a change room/head compartment reveals itself. A privacy curtain folds up from the seat and there is a porta potti available and even a sink in which to wash your hands. 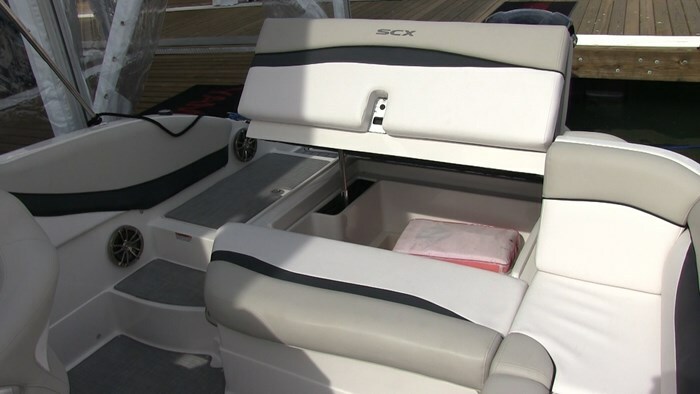 Storage is abound in this boat, under most of the seats, in the floor as well as under the engine hatch like I mentioned earlier. I also mentioned earlier that the SCX has one of the best transom lounges in the business and I’m going to live up to that promise. 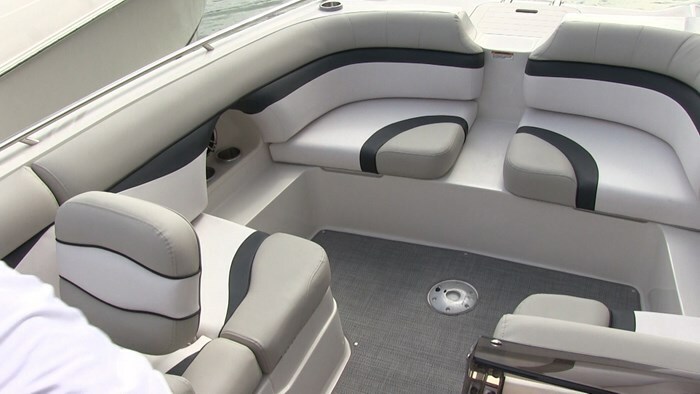 The aft bench seat shares a backrest with the transom lounge. This then lifts up and folds flat to give you a spacious sunbed. What I like about this is how easily it happens compared to other transom lounges, press one lever, lift and pull and you have a lounge. On the transom side of this lounge you will see a bench seat that spans the full width except for the starboard walk through. 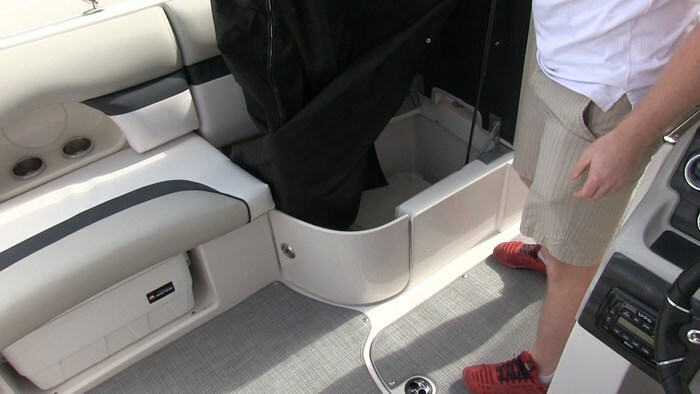 Under said walk through is storage and when you step onto the transom I recommend doing so in bare feet so you can feel the soft touch of the SeaDeck matting. There are two cup holders, speakers, a transom remote and even a shower. This means you’re going to spend a lot of time back here. 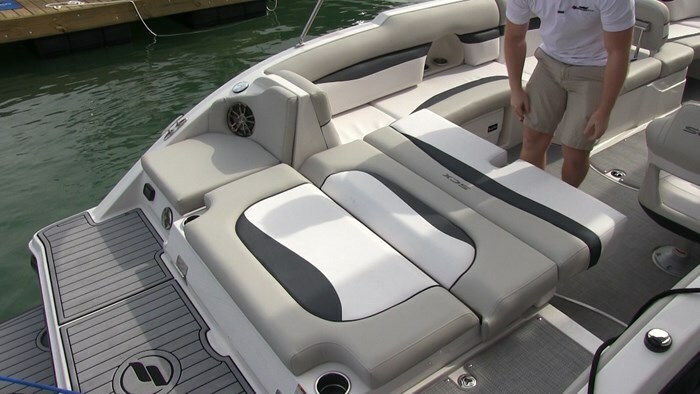 But it also shows there is a lot of functionality with this lounge as the seat is a great height to put wakeboards on and if you’re riding in salt water the shower will be needed for rinsing off when you’re getting out of the water. It’s a boat that is full of features that just seem to make sense. I love the open layout that the 231 provides and I think those who aren’t fully welcoming of deck boats yet will find this boat a great compromise. But when you get out on the water for a test drive, especially if it’s powered by the Yamaha VMAX SHO 250, you will find that with the Starcraft SCX 231 OB EXT that there aren’t really any compromises.